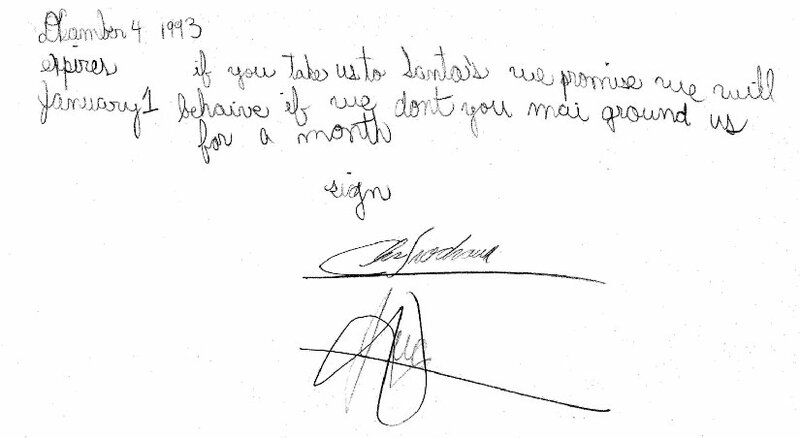 You can tell that contrary to my earmark, my brother had already established a working signature long before he penned up this here agreement, though I will say that it’s pretty endearing to see my infantile attempt at creating a signature just for the occasion. If you examine my signature (the one on the bottom) you’ll find that many of the elements found on Chris’ J. Hancock can be found in mine; it almost appears as if I’m using Chris’ as a template for signature making. Cue the “endeared public” sigh. By “Santa’s” we were referring to a somewhat popular Miami theme park (fittingly named “Santa’s Enchanted Forest”) that opens every year during the x-mas holidays. In hindsight, this really paints my parents as severe and overly strict reactionary-types (something they aren’t in the least). Seems like the only way we could manage to obtain a trip to the theme park was through documented bargaining; I mean, a month of unspecified punishment in exchange for a trip to the amusement park? Talk about all the eggs in a single basket, you’d think “Santa’s” was made of candy that made you grow wings and video games. I’m sure I objected to offering this sort of collateral, but my brother has always been known to drive a pretty solid bargain so I’m sure I caved after one of his often-persuasive speeches, I’m pretty sure that in a passed life Chris was a Snake Oil salesman in the old west. In the end I do remember going to “Santa’s” that year and really getting a kick out of it. Over the years I grew, and like many things when you grow, “Santa’s” progressively lost a good amount of its luster; I began to notice the carnies, the people, the allowance factor, and before I knew it the desire to attend “Santa’s” had just faded, only leaving behind entertainingly written contracts for my father to e-mail other folks in the future.